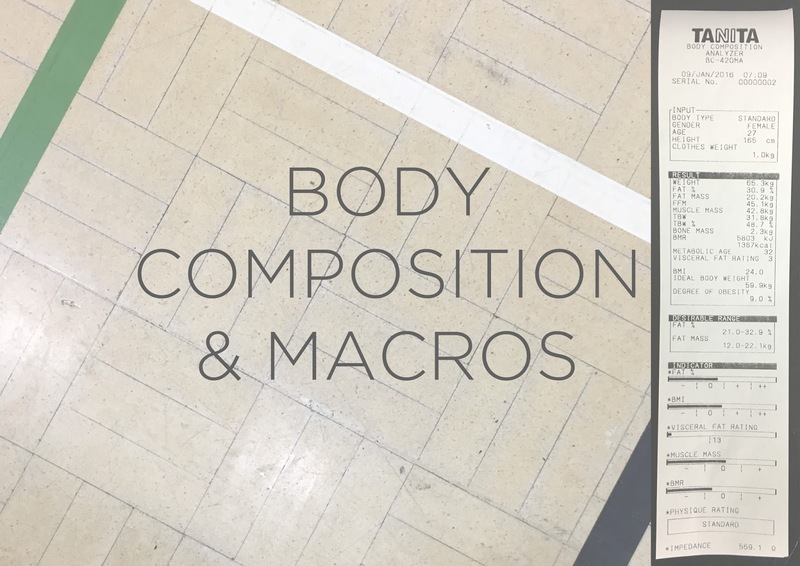 Talking Body Composition and What the Hell are Macros? We’re a couple of weeks into 2016 now and I’m also a week into trying a new way of eating and tracking my exercise to make sure I can shift this last little pesky bit of body fat that seems to be hanging around. What a drag. It all started a couple of Saturdays ago when I was weighed for the first time since Christmas. This is a scary enough thing in itself but this particular weigh-in was also a chance for me to see my full body composition broken down in black and white. Fat %, Visceral Fat %, water % – the LOT. Now, post-Christmas cheese-fest, even just getting weighed in the normal sense is frightening, so to see everything broken down was a bit daunting. Luckily since the last time I had this done mid-2015, my overall weight was slightly up but this was due to an increase in lean muscle mass (woo!) and my overall body fat % had decreased (excellent). These kind of stats are a great opportunity for you to assess where you’re at now so you can start planning your exercise and meals if you have a particular goal in mind (which I do – HIYA getting married in SIX months) or if you want to just know more about your weight and body in general. Women’s fat % is always going to be higher which is just a fact of life – mine is probably a little too high at the moment, so I’ve set myself a goal of shedding 3% over the next few months which is totally achievable, there’s just some hard graft involved. Cue those HIIT workouts. One thing these particular stats already tell you is your BMR (Basel Metabolic Rate). In very basic terms, BMR is how many calories you’d need a day to maintain your weight if were to do zero exercise. Now to get totally geeky, BMR is also something super crucial to help work out a macronutrient plan – a tailored nutritional plan comprising of how much protein, fat and carbs you need a day, depending on how active you are, and this kind of nutrition tracking can help you achieve a certain goal. I am still very much a beginner of learning the way of the macros but if you want to read some more about what they mean and why tracking your macros might be a good way to help you reach a certain weight etc, I’ve popped some links below to pages that have all the info you need, and which make the whole protein/fat/carbs ratio – which can be frankly, a bit mind-boggling- a total breeze to understand. Is tracking macros something you’ve ever considered or done? If so, what was your experience like – did you find it easy or hard to do depending on your lifestyle?